Satisfaction Guarantee: On your first roll, if you are not completely satisfied with the performance of ChannalBAC, within 90 days of receipt, CDT will refund the full purchase price. 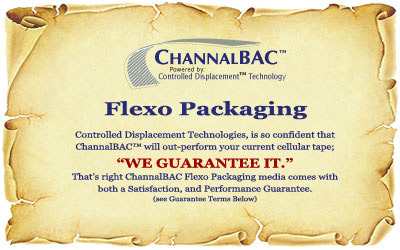 Performance Guarantee: ChannalBAC is guaranteed to be "crush-proof". It will maintain gauge uniformity throughout your longest pressruns, including plates mounted on sleeves for subsequent runs. The plate may wear causing print defects but ChannalBAC will not fatigue or lose gauge, If you believe you experience gauge loss, return the damaged cushion, printing plate, and the printed sample identifying the defect in exchange for a product replacement. This "Performance Guarantee" covers only wear in the ordinary course of printing, and does not cover physical destruction due to press mishaps or abuse. In the event of a return under this "Performance Guarantee", contact your sales or customer service representative for an authorization return number.